Beta Alpha Psi is a prestigious international honour organisation for high achieving accounting, finance and business information systems students and professionals. 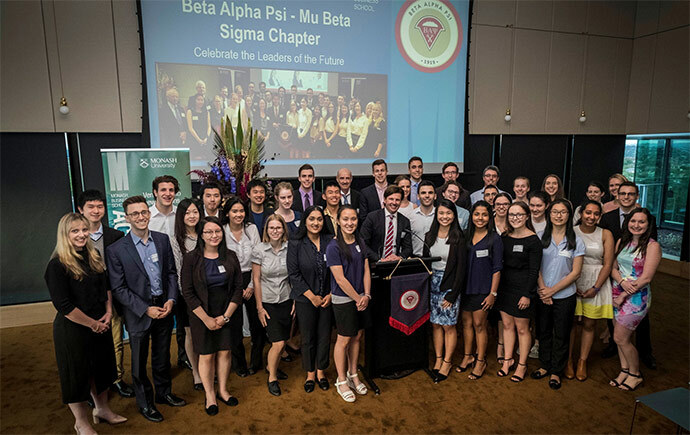 Beta Alpha Psi is one of the premier leadership programs for Monash Business School and has been in existence since 2017.
encouraging a sense of ethical, social and public responsibility. Beta Alpha Psi has three types of events that prepare our members to become the future leaders of business. Professional - Professional events largely focus on personal development seminars and networking with top-tier professional services firms. Service - Service events are centred around volunteering activities which contribute to the well-being of the community. Reaching Out - Reaching out activities extend to the wider community and promote the Beta Alpha Psi brand, within and outside Monash University. To learn more about Beta Alpha Psi and what we have to offer click here.